Not only 1st place ribs, but we also placed 5th in BBQ brisket at this weekends Go For The Gold BBQ Competition. YAY Four Q! I believe that the brisket we turned in was the best that our team had done, I wish that we had gotten first place. Oh well, I had the opportunity to sample the 3rd and 4th place brisket, and they were absolutely delicious as well. Professor Salt definitely rocked the house with the ribs, I feel partially responsible because he was using my WSM water pan. Now I will be able to tell my grandchildren that the water pan in my smoker once achieved greatness. The chicken, well lets just say the my water pan was busy doing other things… the same goes for the pork. Congrats to all of the other teams who participated. As usual, it was great kicking it with all of y’all. CBBQA Forum is back, YES! Thanks everyone, it was quite fun. The only bummer is that the Thousand Oaks competition just got canceled and I’m not sure when we will compete again. Stay tuned. What a beautiful sight. I need ribs now. Congrats on the win! Everything looks great! Great job Four Q!!! 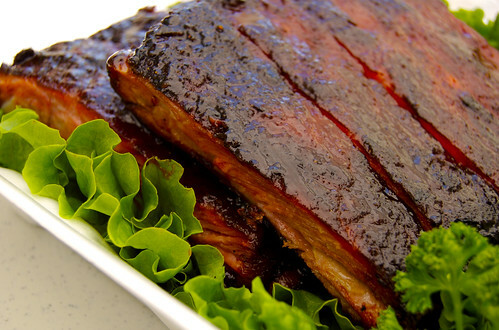 Enjoy that flavor of sweet success for all of your persistance and dedication to producing the best in barbecue! My hat’s off to you all! Congrats!! I’m pretty new at smoking and your blog has been a great help. After seeing those ribs… mmmmm time to makes some of my own. I love BBQ ribs. That is one great photo. I’m salivating after that BBQ ribs now.